In our office, we know that successful orthodontic treatment means starting off right, right from the beginning. When it comes to oral imaging, two dimensional facsimiles just aren’t able to get the whole picture. Capturing all of those nooks and crannies in your mouth demands the capabilities of 3D imaging. That’s why we use intraoral scanners from iTero. Instead of clunky equipment, iTero scanners feature a sleek wand. The dental professional simply maneuvers this wand around your mouth, capturing thousands of frames per second. These frames are then combined to create a three dimensional visualization. The relatively small wands don’t require titanium dioxide powder, meaning that you won’t be gagging or trying to force your mouth open wider than is comfortable. With intraoral scanners, your orthodontist won’t have to wait two to three weeks to find out an image is inadequate. The screens display the digital images as they are captured in real time. This saves dental professionals and patients alike, a lot of time and frustration. In addition, these images are able to capture subtle details. Small details are key to the comfort and efficiency of any orthodontic treatment, with the knowledge of these tiny variations your orthodontist can truly customize your appliances and care. iTero’s intraoral scanners boast an open architecture, making them compatible with the Invisalign system. One feature of this system is the Invisalign Outcome Simulator. 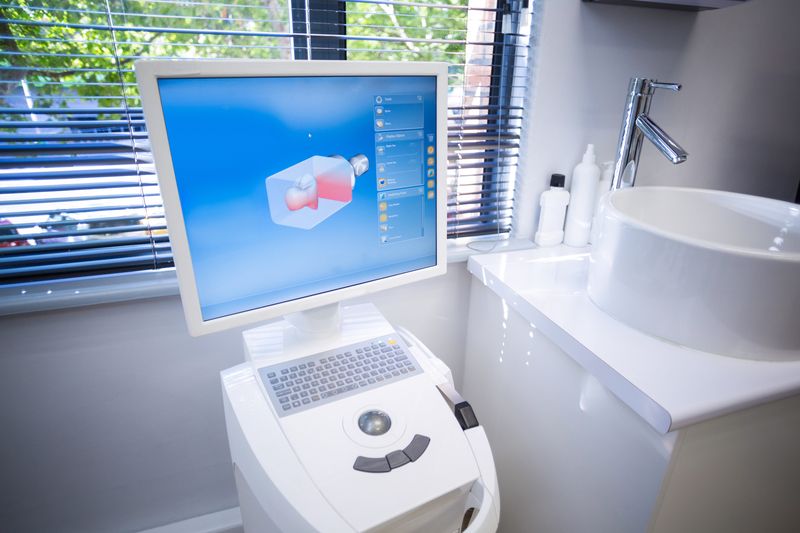 With this, your orthodontist can perform a scan of your mouth, then show you how Invisalign treatment will look! These excellent components all work together to make iTero’s scanners the best in the business. Creating the best possible orthodontic experience for our patients means investing in great technology. Feel free to ask us how intraoral scanners can increase your comfort and speed up your orthodontic treatment today!